If required, add another tsp of ghee and fry the grated carrots on low flame stirring continuously for 3-4 minutes. If using, you can add little grated unsweetened khoya at this stage and cook for few more seconds. I did not add. If you love halwa, then do not miss my delicious Beetroot Halwa Recipe, Easy Wheat halwa recipe and Badam Halwa (almond halwa). Nice one padhu.I am following your blog for quite some time,all the recipes are excellent..keep rocking. Hi padhu, thank you so much for your recipe blogs. All recipes are coming well. I am learning cooking from your blogs only. Great work!!!! I tried your carrot halwa today ,it came out delicious ,My whole family liked it ,Thank you for the wonderful recipe. Lovely recepie padhu. Really very helpful and easy to make .... Thank u . looking forward to more of ur recepies.. Thanks alot for the recipe. 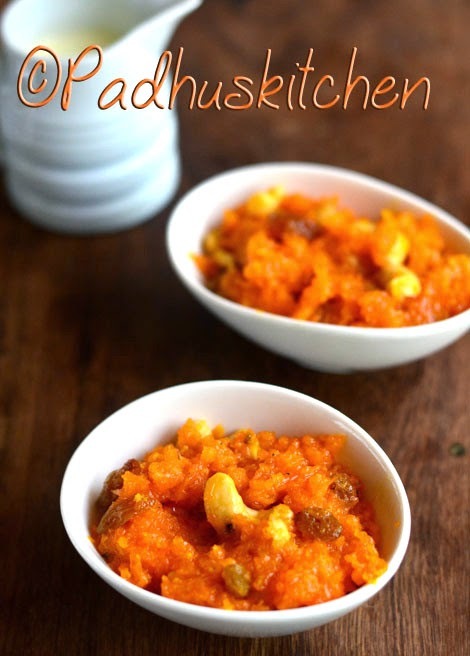 Lip smacking carrot halwa. I tried for the first time and it came out well. I always come back to this post before i make halw and it turns out great every time...thanks . Hi. If carrots become soft and it's difficult to grate them in that case how to make halwa? Use fresh and firm carrots for making carrot halwa. Thanks for this recipe, turned out yum. Thanks. Your blog is my permanent reference page to cook new sweet dishes for my family and surprise my kids. All credit to you. Once again thanks. Keep up the work. You are doing great.